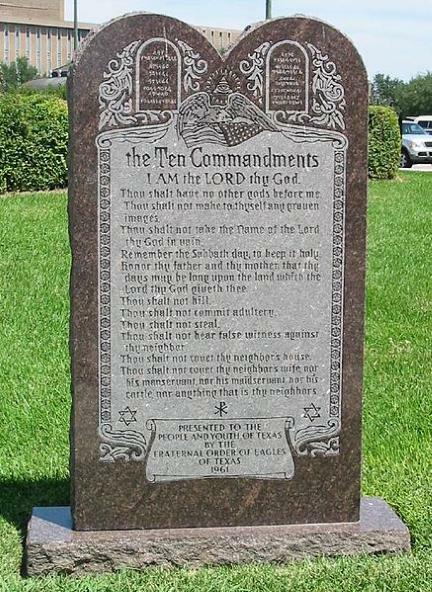 Ever since God gave the Ten Commandments (Exodus 20:1-17), people have been a mite cranky about them. The Israelites broke them, and everyone else has been happy to oblige in breaking them as well (which is one reason taking people through the Ten Commandments is a powerful witnessing tool). They've been around for a few thousand years, and have been making people mighty uncomfortable. Some folks have tried to rewrite them, including Clinton Richard Dawkins (who does not even keep number eight). It's not like there's anything wrong with them — except to misotheists and liberal culture revisionists who mock the authority of God's Word. We're in a pagan evolutionary culture, and the Commandments make for a hostile environment. Some yahoos at Seeker dot com decided to replace the Ten Commandments with their own rules for the "good person" (defining "good" by their own subjective opinions), which would be right at home in a modern Bible-denying church, I reckon. For a discussion of Seeker's spurious version compared to the truth, click on "Do the Ten Commandments Need a Modern Update?" Unless, of course, you need to run to your safe space.